Some time within the last 18 months, I started hearing “Mercury retrograde” almost daily, though only ever from women, and only ever online. Do u believe in mercury retrograde? a friend had asked me last January. Have been having such a bad time again and a few days after it started i found out that mercury was kicking about again. I think i believe in it, because i always find out about it after i've been feeling crazy, not as a precursor. When I admitted to her that I had, indeed, been depressed, she wrote back: c? But, I reasoned with her, wasn’t I often depressed? It seemed absurd to blame the universe for something so frequent. Agnostic about my ‘sign’, I’d always favoured the cult of mental health, instead, which offered a satisfying medical explanation for my blues, i.e. I was simply crazy, rather than star struck. This, in its own way, was comforting; rather than being New Age, I was old-school in thinking myself a hysteric. Suddenly, though, I noticed that all the Internet Girls were brandishing star signs: on Twitter, on Tumblr, in online dating profiles, in tattoos, in articles called things like Find Out Which Rapper Is Your Astrological Soulmate. Women whose work I adored were beginning to talk about “Venus-Mars conjunctions” the way that they’d previously talked about Simone Weil or Anne Sexton. Missed deadlines, once blamed on depression, were palmed off on Mercury. Business Insider, scarcely able to mask their incredulity, put it in writing. “Horoscopes,” their headline yelled, “Are Surprisingly Popular With Educated People!” As if to add — who knew? Gerer’s horoscopes are fluent in the internet’s style and vernacular, so that ‘Gemini’ is pictured as Naomi Campbell twice, in a baby-blue plastic miniskirt. Representing Pisces, Rihanna — here, as in life, as a blunt-smoking mermaid. 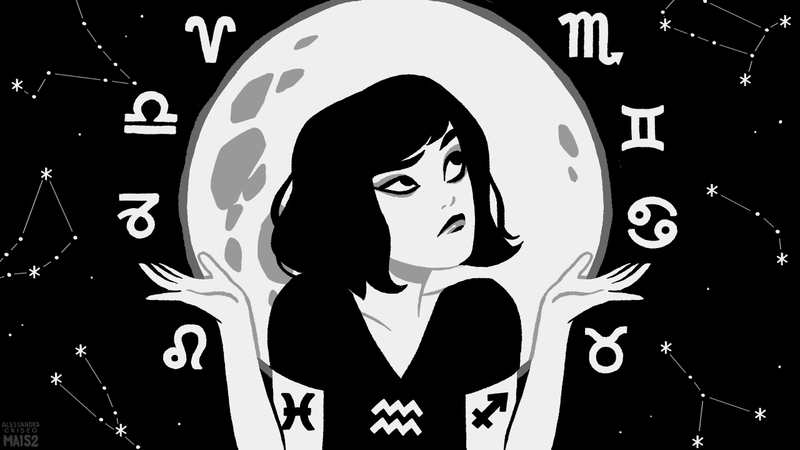 The texts themselves read something like: “MO money MO problems… but not for you, Pisces!” Or: “Foxy Venus is entering your fifth house of fun, romance, and true love. You are so hot right now and you’re not even trying!” They are, effectively, moon-age pep talks courtesy of your most Snapchat-proficient girlfriend. It’s difficult, when I’m vibrating with caffeine and flicking between the four, maybe five utterly useless email tabs here on my laptop, on deadline, to force myself to think about something as vague and remote as “the stars”. Who gives a damn if the moon is in Venus when I’m, mostly, stuck here in hell? A while ago, I wrote about this semi-psychotic half breakdown I had, where I started to read gossip tabloids obsessively, parsing the stories for personal meaning — you get, I am sure, the gist of where I am headed with this analogy where I am mining the lives of the “stars” for significance; being “postmodern” about it and, maybe, “insufferable” also. In particular, I had seized on Lindsay Lohan — then on about her fifth DUI — as my redheaded groundhog. Following the logic of “stars — they’re just like us!”, I saw her breakups, crashes, drug arrests and public humiliations as psychic mirrors for something unnamed that was happening to me; seeking a sick kind of sisterhood, I read her like tea leaves for failure, failing to notice that this in itself was not much like succeeding. Similarly aged celebrity women who excelled where I floundered, I chose to ignore, as their lives did not fit the desired, damned narrative. No loser — sane or insane — looks for patterns that prove they are outlying data, and back then I knew I was losing — it, money, the plot — even if I was unsure of everything else. This was as close as I came to believing; evidently, however, I’m not alone in my habits, as there exists (or existed) a magazine with the self-explanatory title Celebrity Astrology, covering both kinds of stars and their interplay. “Diddy’s reluctance to make a commitment may be nearing an end as [his progressed] ascendant, moon and Venus come together,” reads the issue she’s profiling. “[Tom Cruise and Katie Holmes’] compatibility is thwarted by their mutual Jupiter and Saturn opposition, an aspect that indicates one is restrictive of the other, tending to impose their ideals…” This last astrological divination has since proven, obviously, true, though given the many stories about the nature of Cruise’s and Holmes’ marriage, I’d also hazard a guess that their breakup was not down to Jupiter. One half’s ideals may have jarred with the other’s, but nothing about it was planetary. Any relationship has to go one of two ways — it continues, or it doesn’t, and so any outside prediction succeeds 50/50, de facto. “When you’re feeling stuck,” says the Editors’ Letter of N+1 magazine’s New Age edition, “one way to convince yourself change is in the near to middle distance is to read a horoscope.” And — aren’t I? Still, I loathe the idea of being the subject of bets – even cosmic ones. This is another reason I’ve tended towards disliking the idea of horoscopes and astrology — never a natural gambler, I shrank away from playing the odds. If the zodiac’s house always wins, I’d figured, then why bother playing? So, didn’t. “What sign are you?” she asks the interviewer, who looks not unlike Fabio. America’s very first billionaire, JP Morgan, supposedly once said that while “millionaires don’t use astrology, billionaires do.” Nobody, of course, can remember the context, so Morgan might have been saying that billionaires are paranoid and superstitious as much as he’s saying that astrology-lovers succeed. Either way, there are 1,810 billionaires in the world, and of these, only 197 are female. Madonna, whose sound financial advice in Material Girl might have saved a billion women from deadbeat boyfriends to date, is halfway there with her net worth and, it would seem, all-in with her horoscopes. “They — straight men — are supposed to be aligned with the rational, aren’t they?” a friend of mine, who edits a science-fiction magazine, shrugged. “And astrology is traditionally fey. It’s traditionally femme. There’s also this sense that nothing about the world makes sense now anyway, so why not?” This would also appear to be the scientific line – that men, as confident as they are in the final, exemplary outcomes of their own (white, heterosexual) lives, don’t typically need the assurance. If the earthly realm is tipped in your favour, why look to the heavens? Over the winter, I once cracked open a fortune cookie to find a slip that said: “you would make an excellent actor,” which felt less like a compliment than it did an accusation — fortune cookies, for me, being neither more nor less about superstition than horoscopes. I felt sick and, worse, seen. The idea of being perpetually watched by the universe is bone-chilling. All else aside, if I’d wanted to feel seen at all times, I would’ve kept praying. There is something worse, though, which is never being seen, and seeing nobody. Here is a scrambled message, caught like a star in a bottle: I am a Pisces whose moon is in Aquarius. I have some outstanding qualities in my field, and I work like a magnet for those with the same interests. My deluxe moon energy might make me really good at setting financial goals, though this doesn’t seem accurate. My sign is either the fish, or Rihanna. I hope it’s Rihanna. My messenger planet, Mercury, is in its natural base in the third house of communication this week, and as a result my conversation is so smooth. If I were a Thing In The Video For Hotline Bling, I — that is, Pisces — would be Drake himself. I won’t feel lonely in 2016. I am experiencing a month of unprecedented calm. I know how to feel intensely without showing it. I am, mostly, characterised by empathy, ruled by Neptune, and more emotionally expressive than most. If I were to date a rapper based on astrology, it would be Kanye West.